A gem on the False Bay coastline, Kalk Bay is known for its raw beauty, interesting shops, vast selection of restaurants and stunning views. You could easily spend a full day in this little neighbourhood and still not be able to experience it all! Here’s a guide on what to do and where to go in Kalk Bay. One of the toughest decisions you will have to make when you visit here is where to eat. There are so many places to choose from and each one is unique from the next. This is one of those café’s that you discover when you head off the main stretch. This little café serves up, well, all things bagel related plus more and opens up onto the park in central Kalk Bay. Sitting right on the rocks and giving diners an amazing view of the ocean, Harbour House is a fine dining establishment that offers great food and amazing views. The price of the food is a little above average, but it’s well worth it. Also, keep a look out for the winter specials where you can pick up a two- or three-course meal at a fraction of the price. Falling under the Harbour House banner is Spanish tapas restaurant La Parada. This is a great place for some good seafood in bite-sized portions. Think dishes such as octopus salad and prawn croquettes. The venue is laid back with a rustic feel. Another Harbour House brand, Lucky Fish and Chips is exactly that – fish and chips. Sitting in the harbour right next to Live Bait (yes, another Harbour House brand), these two are there for anyone who wants their fish and chips experience right by the harbour watching the boats come in. This outdoor café is casual and sophisticated all at once. They serve great Lavazza Coffee, freshly baked goods such as croissants and pastries, freshly squeezed orange juice, delicious breakfasts and is great for lazy lunches. It’s known for its three-egg omelettes, eggs benedict, salmon croissants and seafood linguini. Lekker: meaning good, tasty, delicious, nice or anything to express approval or satisfaction. Who can resist an eatery with a name like this? 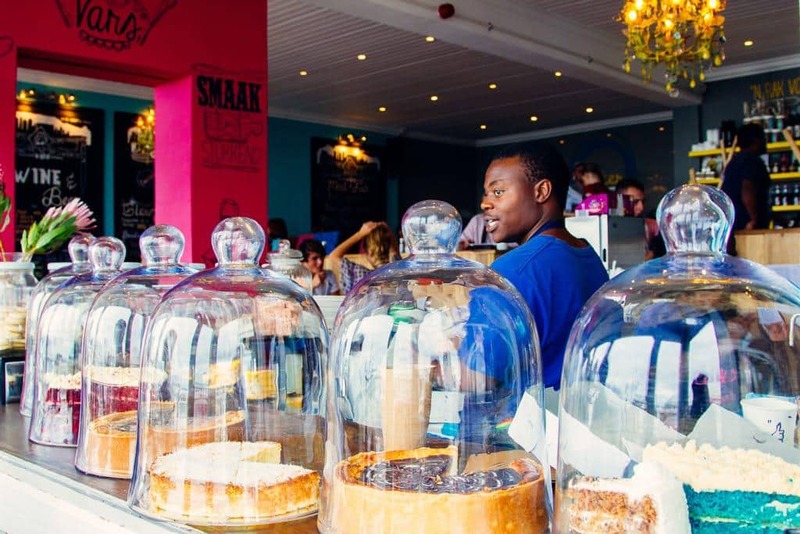 Situated on the main Kalk Bay strip, the restaurant claims to be the place to go if you’re looking for lekker coffee, lekker pastries and cakes, lekker food, lekker staff and service, lekker local favourites like milktart, koeksisters, botter marie and tea, vetkoek with jam and so much more. This was a nice little find up a side road in Kalk Bay. Pop in here for some good coffee and breakfast, brunch or lunch. Courtyard Cafe is situated just off the main road between Artvark Gallery and The Kalk Bay Theatre and close to the central park so it’s great for families with kids. Sitting just behind Kalk Bay Books Under The Cypress, formerly known as The Annex, is just off the main road and sits in a historical building. The veranda overlooks the harbour and is one of the most picturesque spots in Kalk Bay to enjoy a meal. A Kalk Bay institution, Kalky’s sits right on the harbour and is known to serve up fresh fish and chips in a relaxed and unpretentious setting. You can take your own wine and relax with the family while watching the local fishermen haul in their latest catch. Olympia is one of the better known places in Kalk Bay and it’s easy to see why. This bustling eatery keeps their menu simple with a chalk board with the day’s food on it. Everything is prepared from scratch and portions are large. The setting is rustic and the staff are friendly. The space is small and popular so get there early to secure a table. Around the corner from this eatery is the famous bakery with the red door. Here you can buy all the yummy pastries served at Olympia plus pick up some delicious Truth coffee. Well known for its live music offering, the Brass Bell Restaurant and Bikini Bar offers up something for everyone. There are various ways to enjoy what this establishment offers. The Brass Bell Grill is the main restaurant area and seats 60. The elevated Captains Deck offers the same menu as the Grill but with a bird’s eye view of the ocean. The Bikini deck is where the live music unfolds. Pop in here for some cocktails and entertainment. 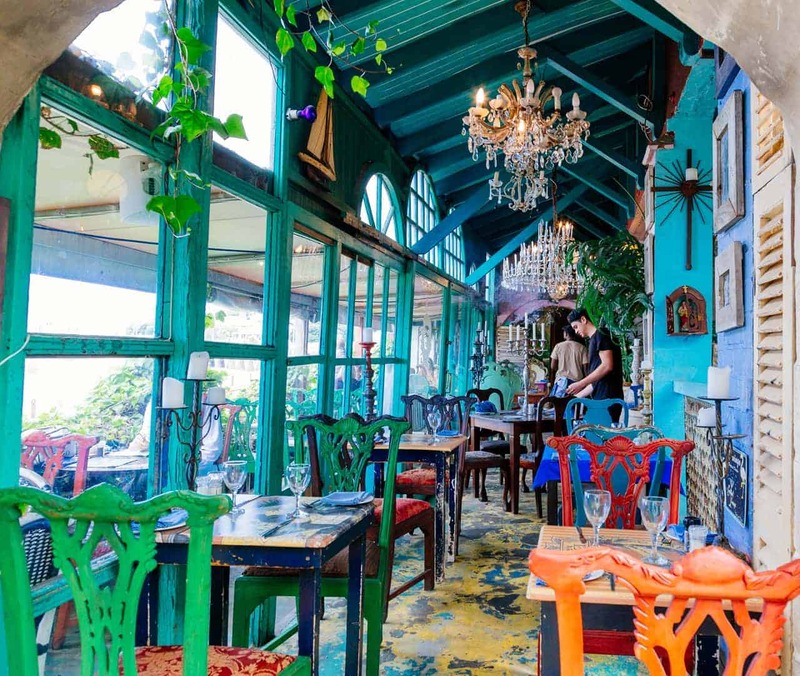 This restaurant/bar/party venue is well-known on the main Kalk Bay strip. It’s been around since 1995 and most nights, all tables are booked. The beach bar is a great place for casual drinks while dinner can be had overlooking the ocean. This is for those who love a vibey atmosphere, good music and some dancing. For some of the best ice-cream in town, pop in to the Ice Café on the main strip in Kalk Bay. They make their own ice-cream in all of the best flavours – chocolate, peanut butter, strawberry, ginger, apple, black cherry and brandy, cinnamon and much more. All the ice-cream is natural and made with no eggs. There are a number of caves worth exploring in and around the mountains of Kalk Bay, but it’s best to take someone who knows the area or familiarise yourself with the route. The best one for the novice hiker or for a group is the one up to the Boomslang cave. The start is at the Echo Valley sign on Boyes Drive. It’s about 4 km long and will take around two hours. The reward is amazing views of False Bay and some cool cave exploring for those who aren’t claustrophobic. The cave goes right through the mountain so it’s a great adventure for friends and families! Better yet, AWOL Tours also offers guided tours through the Boomslang Caves, ensuring you get the most from the experience. There are PLENTY of shopping spots in Kalk Bay. This is where you go when you want to find something unique and less ordinary. The Kalk Bay Co-op is a space where local designers get to sell their items. There is everything from stationery to clothing to jewellery and more. 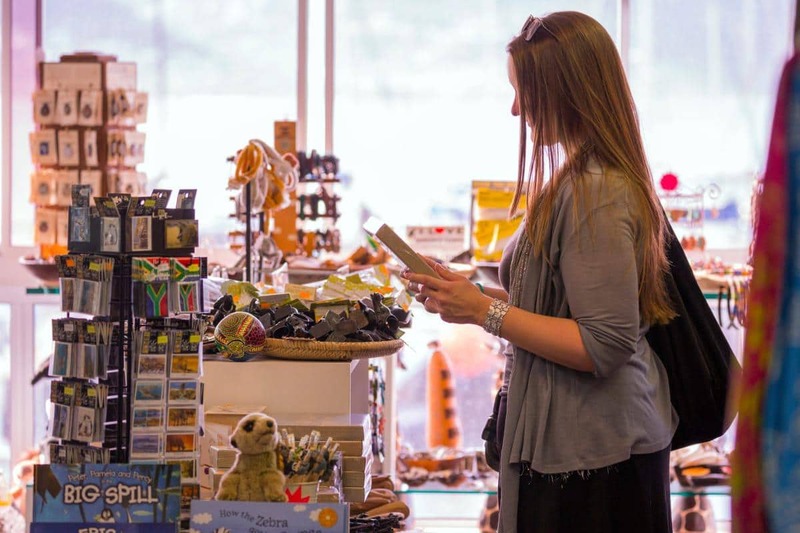 The Kalk Bay Quarter (contact: +27 (0)21 788 6312) offers up similar things plus various souvenir items, while Papagayo (contact: +27 (0)21 788 1923) is perfect for those who are looking for the more unique bag, décor items, clothing and more. Kalk Bay Modern has plenty of beautiful paintings, photographs, sculptures, décor items and more – most of which are made and done by local artists. Also, look out for the various antique and bric-a-brac shops. You never know what you will find here! Under new management, Kalk Bay Theatre is the place to be these days. All shows are handpicked and many are sold out, so be sure to book early! Take advantage of the two-for-one Tuesday tickets to get a good deal. You can have dinner at the venue beforehand, plus a coffee afterwards to mix with the crowd and artists. This is one of Cape Town’s best book stores, at least I think so. Those who run the shop have made sure not to punt the more commercial things. Here you will find classics you possibly thought weren’t available in SA as well as lots of books by local authors. It’s a wonderful little store that all book lovers will find hard to visit and not walk away with a book or two. Take the Kalk Bay Audio tour with Maggie Follett: freelance journo, poetry scribbler and occasional filmmaker as your guide. A proud local and mother of two, Maggie is the perfect guide to take you on a relaxed and informative tour. This popular route takes you on a gentle but bracing stroll around the spectacular curve of False Bay, from the laid-back coastal suburb of Muizenberg (the gateway to the South Peninsula), via beautiful St James, to the vibey, bustling village and harbour of Kalk Bay. If you’d like to spend the night there’s loads of accommodation available, including excellent bed & breakfasts and guesthouses. And most of these have stunning sea views! Contact Cape Town Tourism on +27 (0)21 487 6800 to help you make a booking or email us at info@capetown.travel. Nobody knows Kalk Bay better than a local. When you’re in town be sure to visit the closest VIC in Simon’s Town where staff can help you really uncover the magic on offer in Kalk Bay and surrounds.